Updating the site will be a bit slow, because of my ISP... Apparently, I exceeded the fair use limit and they have reduced my Internet speed to a pathetic amount. Other stuff is still great, though. Well, my ISP seems to have a data transfer limit of 5GB only! Imagine that. 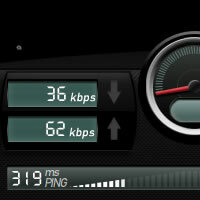 I think I broke it this month and my Internet Broadband speed is now reduced to less than 56kbps. In fact, here is the speedtest result! Other news: Remember the Armor Games Snowball Series? Well, Armor Games Snowball 2009 is coming up! I will also be working on the 2nd installment of Final Slam, which is Final Slam 2. The Strategy Game War and Beyond Deadly Strategies is almost ready for launch too. I will try to see if I can launch it by end of November or in December. War and Beyond Deadly Strategies is by far the flash game that prompted me to put in the most effort into. The development time spanned about 6-7 months, that is if I am able to launch it in December 2008.